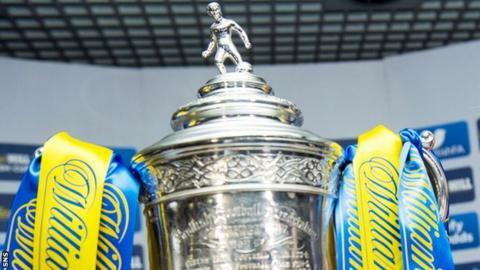 Highland League sides Fraserburgh and Wick Academy, plus Lowland League outfit East Kilbride, have booked their places in the Scottish Cup third round. Fraserburgh set up a tie away to last year's runners-up, Falkirk, after a 3-2 win away to Turriff United, who sit one place above them in the league. East Kilbride won their replay away to Highland outfit Forres Machanics by the same scoreline. Wick hammered Highland League rivals Nairn County 5-1 in their replay. The tie between Highland League side Fort William and Cove Rangers was postponed for a second time. Wick next host junior outfit Linlithgow Rose, this week's draw having ensured that at least two sides from outwith the Scottish Professional Football League will reach the fourth round. Craig Hastings scored twice for East Kilbride and their victory means they will travel to Ochilview Park to face League One outfit Stenhousemuir. Fraserburgh, whose initial tie at Turriff had been postponed, came from behind twice to equalise before Bryan Hay won them a trip to Falkirk Stadium with a goal in stoppage time.